Tri-Kiawah is a USAT sanctioned intermediate distance competition featuring a .7-mile swim, 25.1-mile bike and 6.1-mile run. This race is currently the only intermediate distance triathlon in the Charleston SC area to feature an ocean swim. The competition kicks off with the .7-mile point-to-point swim in the vast, beautiful and calm Atlantic waters off Kiawah’s stunning coastline. The bike and run portions of the race take athletes along the scenic marshland, maritime forest and beachfront, allowing participants to capture the unique essence of Kiawah Island. Transition area will take place in Night Heron Park, a 21-acre spectator and family friendly park at the heart of Kiawah Island. The Kiawah Island Golf Resort Triathlon will not only test beginner triathletes, but seasoned competitors alike in a unique environment that showcases Kiawah’s diverse natural habitats and unparalleled beauty. Interested in Sponsorship and Vendor opportunities? Contact Race Sponsor for information. Course time limit of 4 hours. The .7-mile point to point swim takes place in the Atlantic Ocean in front of The Sanctuary Hotel on Kiawah Island. Athletes will be swimming with the current. Ocean temperature is expected to hover near 79 degrees Fahrenheit. On Kiawah wave height can vary daily averaging 6 inches to 3 feet. All participants must wear the official race swim cap provided at packet-pick up. Following the swim event, athletes will travel approximately 200 yards over a boardwalk and asphalt bike path to the Transition Area at Night Heron Park. The 25.1 mile bike course is a well-marked course that stretches the entire length of Kiawah Island. Winds are expected to be moderate to light as athletes bike through Kiawah’s maritime forest, with winds increasing in strength through the vast and open salt marsh habitat. Helmets are required. Blue Sky Endurance of Charleston has aluminum and carbon bikes available to rent on a daily or weekly basis. Aluminum bikes are $40/day or $150/week, and carbon bikes are $60/day or $250/week. The race ends with a 6.1-mile run that loops through well-shaded neighborhoods. Participants can expect an elevation change of less than 18 feet throughout the entire course. On the run, aid stations are available at approximately mile 0.01, 1.5, 3, and 4.5 . Aid stations will provide water and Heed Sports Drink. Short sleeve race shirt, swimmer’s cap, finisher’s medal, course support, food and entertainment at the finish line party. A limited number of entries are available for the Kiawah Island Golf Resort Triathlon. If spaces are still available, we will allow race registration through race day. As we approach capacity of our race, we will notify friends via Facebook that registration will close in 48 hours. 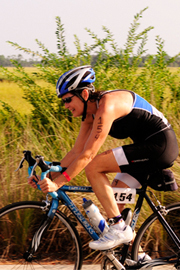 Kiawah Island Golf Resort Triathlon is a sanctioned event through USA Triathlon Association. The option to purchase a one-day membership ($15) is available when registering for the race. All participants are required to show their USAT membership card at Packet Pick-up. If you forget your membership card, you will be required to purchase the one-day membership. No refunds will be given. Rules: All participants are responsible for knowing and abiding by USAT and Kiawah Island Golf Resort Triathlon rules and regulations. Athletes registering as individuals must be at least 17 years old by December 31st .